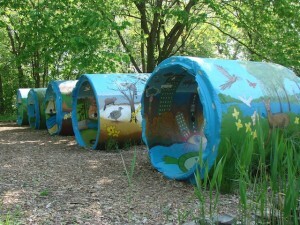 The Ecoart Committee of the Teaneck Creek Conservancy in Teaneck, NJ seeks proposals from ecoartists or ecoartist teams to create an ecoartwork in 2012-13. The Teaneck Creek Conservancy is a 46-acre eco-park within Bergen County’s 1,200-acre Overpeck Park, this property is being reclaimed and rehabilitated as wetland habitat and for positive public use through a unique “Brownfields to Greenfields” project. Community-based plans for the Conservancy are developed by artists, activists, scientists, historians, educators in a non profit partnership with local government over the past ten years. These plans have created a park with a 1.5 mile trail system for passive recreation, eco art, wetlands research and rehabilitation, and public outreach and education that is focused on the property’s environmental resources, land use, and history. For this project, they are seeking an experienced ecoart practicioner, who´s capable of responding imaginatively to a recovering urban forested wetland, and will work collaboratively with community students and volunteers, and mentor a local artist in the creation of the piece.The work should build support among the larger community for an understanding and definition of ecoart that is inclusive yet underscores the notion of ecology and our impact on this recovering environment. The process will be video documented throughout the residency period. The Anticipated total budget including artist(s) fee is a range of USD$15000. – 20000. 2) Up to 5 images of representative works that address the requirements of this RFP. Images should be smaller than 1MB. A website address can be substituted. They are interested in viewing your work as an ecoart practitioner. 3) C.V. , either via e-mail or associated with a website. 4) Contact information including daytime phone number. You can check the proposal form at Teaneck Creek´s website and you can also check www.PuffinFoundation.org for further information and directions.